You probably know the feeling… whether it was a soccer ball to the gut, a bicycle handle bar across the stomach, an older brother or school-ground bully slugging you in the gut… Most people have had the wind knocked out of them at one point in their lives. Short of getting knocked out, there are few things that are more debilitating than getting the wind knocked out of you. And while the injury itself will only hurt for a few minutes, in a real-world fight where anything goes, that brief period where you’re sucking wind like an asthma commercial leaves you helpless… which can result in anything from people pointing and laughing at you, to being stomped out of existence by an agressor. So today I’m going to talk to you about how to keep this from happening in the first place. First I’m going to talk to you about WHY this happens. Next, I’ll tell you what to do to recover as quickly as possible if this does happen. Then I’ll share a few simple techniques you can use to keep this from happening in the first place. Your lungs are like two big air filters… And there’s only one mechanism to pull air into the “filter”… That mechanism is called your diaphragm. Your diaphragm is a sheet of skeletal muscle that extends across the bottom of your rib cage. It separates your thoracic cavity (lungs, heart, ribs) from your abdominal cavity (stomach, intestines, etc.). When this muscle contracts, it pulls air into your lungs. A hard enough strike to the region of your solar plexus (celiac plexus) causes your diaphragm to go into spasm… rather than pulling air in and pushing it out, it just starts freaking out… which is exactly what your breathing does. I’m always surprised when I spar with “martial artists” and every time I hit them in the stomach they wheeze and gasp… Or get the wind knocked out of them. Especially when the defense against this is fairly straight forward. The first thing you MUST do in any ‘fight’ situtation is simple: keep your stomach muscles tight and flexed. 1) They are your armor. Your abdomen is filled with all sorts of soft squishy stuff that doesn’t take kindly to being kicked, punched, stabbed (or tickled). Your abdominal muscles are there to protect them. They are incredibly strong, and you can engage them for a very long time without them burning out. You must keep them tight the entire time your attacker is in range to do you damage. 2) The abdominal muscles are the conduit of power for your body. Much of your power in a properly thrown punch or kick comes from your legs and the transfer of power from moving your legs and hips up into your upper body. A punch from just your arm lacks real power… A kick that is a flick of the leg won’t do much damage… but a kick or punch that engages the whole body… THAT is how damage is done… And the stomach is at the center of it all (literally and figuratively). However, a well placed uppercut or shovel-hook into this region, if thrown hard enough, can power right through even a flexed stomach. So keeping it flexed may not be enough… You also have to keep it covered. To a sophisticated fighter, your solar plexus is a big bullseye target… and they will seek it out. If you leave your solar plexus open, you’re begging to get hit there… One trick to protect it is taken from Bruce Lee… By keeping one of your arms close to your “center line” or sagital plane, you obstruct your opponent’s ability to strike you there directly. Leaving nothing between your opponent and your solar plexus is generally not wise. If, despite reading this article, you still get hit in the solar plexus, the first thing you need to think about is how to still defend yourself. I’m a scuba diver, and I know for a fact I can go 3 minutes without air. And 3 minutes is a lifetime in a fight. Now naturally you’ll be amped up, heart racing, and your solar plexus is spasming… Which changes things greatly… But a fight is still mostly mental. You CAN decide to push through the pain, and decide to keep defending yourself. If you give in to the pain, and curl up on the ground, you’re begging for a much worse beat-down. Finally, there’s a stretch that tends to help stop the diaphragm from spasming… If you lay on the ground, belly-down, and push your upper body up like you’re doing a push-up, while keeping your hips pinned to the floor, it will stretch your stomach out and help calm the spasm. After all, no one likes to be a spaz! I hope you found this article helpful. If so, rate it and share it on facebook! 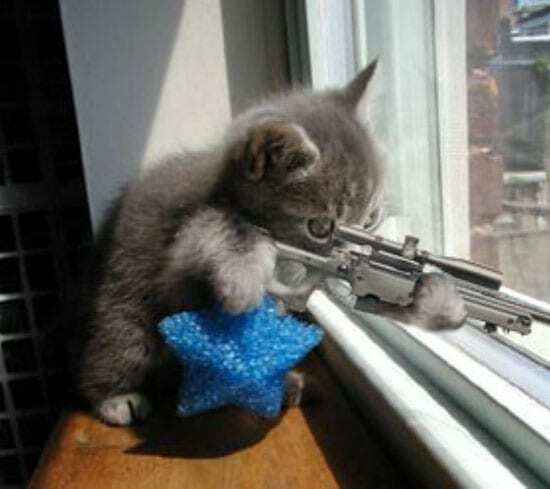 If not, then here’s a picture of a kitten shooting a gun.